When : Friday, January 18th at 6:30 pm. Where : Annex of Middle Collegiate Church, 50 E 7th St (East of 2nd Ave) Click for map. Adam Feder and the Shul Band. ​​​​​​​A Tu B'shevat Seder will follow the service. Please register. Please Note: In light of recent events, the local police precinct will provide additional security at Shul services. 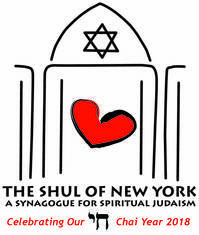 The Shul of New York Shop - click to shop in the official Shul store. Now featuring limited edition Chai Year items! Follow the Shul on Facebook! You Shop. 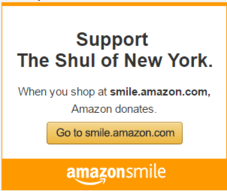 Amazon Donates to The Shul!! blog called Shul Community News. Click here to read Shul Community News. Bikkur Cholim means "visiting the sick" but in practice it is so much more. The Shul of New York's Bikkur Cholim iniative will provide support to individuals and their families. see Bikkur Cholim on the Shul website, or email Rabbi Eva.